I had my wife pick this up for me during a hospital stay when I was laid-up for 11 days (don’t even ask). I do plan to pick up a Sony PSP eventually too, but Nintendo’s never steered me wrong in handheld gaming. I have not been disappointed with my DS, and have even found myself playing it to the exclusion of my home systems. It may not be as powerful as the PSP, but it’s certainly powerful enough for a handheld and I’ve yet to feel wanting for more polygons. It’s a continuation of what made every past Nintendo handheld successful combined with two new innovations – the touch screen and microphone – that really do work. Add in wi-fi networking and you’ve got a great little device without annoyances like long load times or poor battery life, and with all of Nintendo’s signature game series and innovative new titles (such as Nintendogs). You’ll notice I have the “electric blue” system, in keeping with my theme of (almost) always going for non-standard colors in my game consoles when the opportunity exists. I was actually hoping for a teal or other truly limited color, or one of the funky Japanese hues that are on the market there, but being that I was in the hospital there really wasn’t a lot of choice available under the circumstances. Still, I like it better than the stock silver. 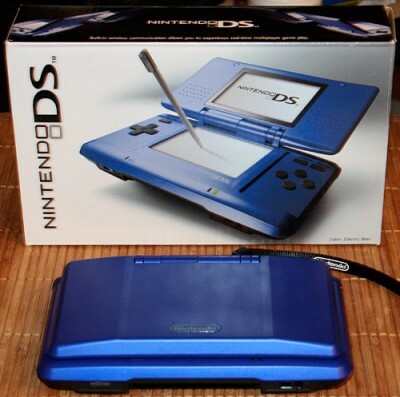 Obviously, the “DS Phat”, as some people call it, was discontinued a while ago now in favor of the DS Lite – and I wish I had one of those. But c’est la vie – I just needed something to take my mind off my excruciating pain while stuck in a hospital bed, and this thing helped get me through. 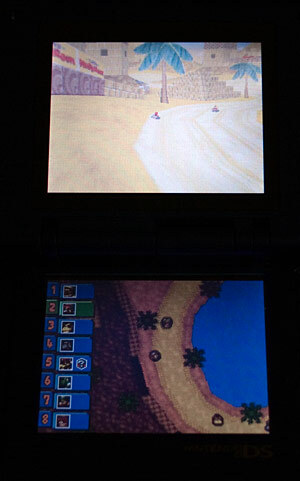 If the top screen appears washed-out and the bottom screen too dark, it’s simply the relative angle – the DS does not open completely flat, so by necessity to photograph the screens, one or both will be at an angle to the camera. ever thought of buying a Nintendo DS i?